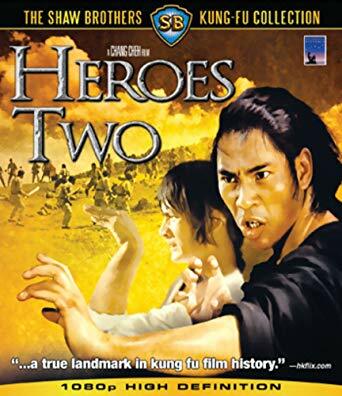 Not many Shaw Brothers movies have made it onto Blu ray yet, but this was one of the early releases by Tokyo Shock, the Chang Cheh directed Heroes Two. Starring Chen Kuan Tai and Fu Sheng they play the Patriots, Hung Hsi Kwan and Fong Sai Yuk who fled the burning of the Shaolin Temple by the Manchu’s. The film has Fong Sai Yuk unwillingly helping the Manchu’s to capture Hung Hsi Kwan and after realising his big mistakes, goes all out to rescue his co-patriot and then battle to the death the men responsible for the destruction of Shaolin. The film was one of the first of what was called Chang Cheh’s Shaolin cycle of films, both stars do very well in their roles, Chen Kuan Tai is stern and solid while the then only 18-year-old Fu Sheng gives a great performance as Fong Sai Yuk both arrogant and playful. 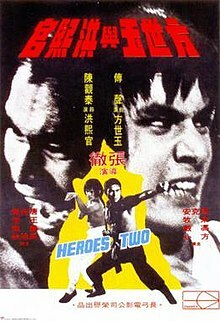 The choreography by Lau Kar Leung is good and intricate considering it was made in 1973/74 the only let down is the main villain as you can see is not a martial artist and never really poses a threat to our two heroes. It is a little bloody as usual for a Chang Cheh film but he uses a strong red filter during death scenes, partly as an artistic statement but also because stricter censorship was being introduced into Hong Kong at that time and it was a way to get away with certain things. This Blu ray released by Tokyo Shock is very impressive. It has a superb 1080p HD transfer, no blemishes or marks are to be seen on the print and colours are very vibrant. Audio has choices of Mandarin or English dubbed mono, thankfully no awful 5.1 remixes. Subtitles are clear and concise and easily read in a yellow font. Loads of extras are also added. Firstly a great audio commentary by Linn Haynes a Hong Kong cinema expert who sadly died in a car crash not long after he did this. A sad loss for a true kung fu movie fan. Also, we have the prologue called “Three Styles of Hung Fist” this intro was originally shown before the film but here you can see it like that or separately. It also has two versions of it, the original and the Celestial “jazzed up” version. Other extras include a series of trailers and an interesting interview with the star Chen Kuan Tai. One final note. Although it says Region A on the packaging it seems to be region free as it played ok on my region B player. 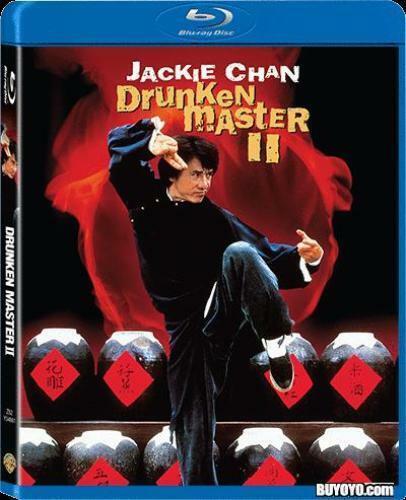 Overall a class release, it’s a shame that Tokyo Shock has stopped releasing this classic onto Blu Ray. Totally recommended.